….at the Farmers Market last sunday. Pouring with rain for the 2nd week running. 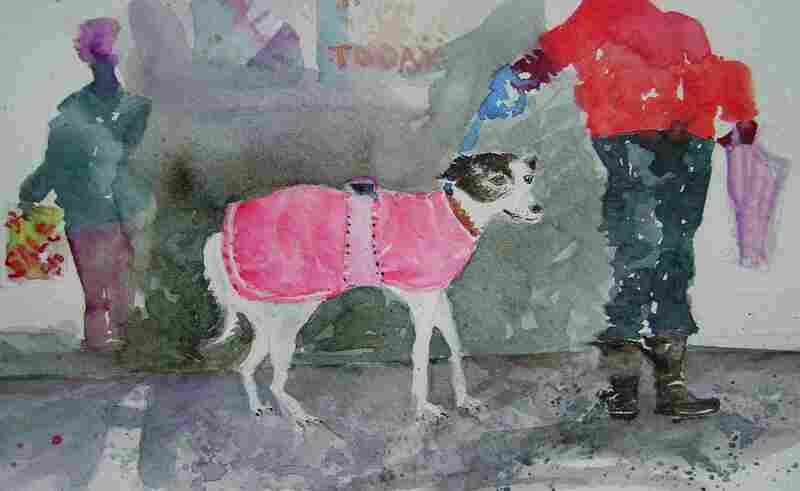 Luckily Bella was wearing her snazzy pink coat. Another great character was Cracker, the tiny Italian Greyhound, who had not only a superb coat, but also sported an “undercoat” – courtesy of a Tesco carrier bag. Very clever. thanks to everyone who braved the rain and wind, and for the great comments about my artwork. This is just a very quick sketch, so I’m hoping Bella likes it. Bella may feature in a more considered piece next year – Botanical Gardens with Pink Ice Cream Van – a long overdue update of the “red” version. This entry was posted in Sheffield - watercolours and tagged Famous Sheffield Shop, Farmers Market, Sharrow Vale, Sheffield. Bookmark the permalink.